I'm deeply shocked by the news that a powerful bomb attack occured in Palmanova, Balearic Islands. Police believe the attack was carried out by an ETA cell that came to the island specifically to carry it out and was not based there, it is said. Please, let there be no harm to the Islands - no terror, no anger, no fear, no hatred, no sorrow. Mallorca is Europe's favourable tourist desination. And please do no harm to the Spanish monarchy. Please no damage to the Holy Cathedral of Mallorca ! 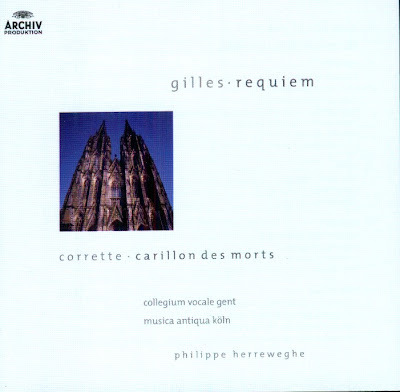 Jean Gilles' Messe des morts may be regarded as the best of all (French) requiem masses. When the Messe des morts was completed, however, the patrons refused to pay him the agreed sum of ten louis d'or, claiming that the work had grown too elaborate and a performance would be far too expensive. "Gilles was so incensed by this that he claimed: all right ! Then it shall be performed by no one, and I shall be the first for whom it is given !" He would not have long to wait: the composer, sickly since childhood, died on 5 February 1705, barely a month after his 37 birthday, and the Requiem indeed seems to have had its first perfomance at his own funeral. Probably Gilles and his Messe des morts would then have been forgotten had not André Campra, eight years his senior, whom Gilles had known in their student days, conducted the work and later taken it with him to Paris. There he performed it at the Concert Spirituel, where he became incredibly popular and was given at least 15 more times until well into the 1770s. With its thouroughly "theatrical" expressive gestures, modelled after Lully's tragédies lyriques, Gilles' Requiem correspondes exactly to the taste and requirements of Parisian musical life. Here and there are passages of "learned" counterpoint, as in the "Domine Jesu Christe" fugue of the Offertorium, but in spite of all the work's depth and loftiness, the predominant mood is one of cheerful lightness. This can be heard in the many passages in triple metre, but even at the very beginning of the Introit, in which the tenor intones his"Requiem" recitative, wholly operatic in style, over a dotted march rhythm. In the Communio, at the end of the requiem, the sorrow predominates again. After two final, particularly grand performances - in September 1764 in Paris at the memorial service for Jean-Phillipe Rameau, with 180 musicians of the Académie Royale de Musique, and in May 1774 at the funeral of King Louis XV at Versailles - Gilles Requiem went unheard for nearly 200 years. But the work was mentioned and praised in so many sources that it was rediscovered relatively early by the recording medium: in 1958 Louis Frémaux conducted its first appearance on record with the Orchestre de Chambre Jean-Francois Paillard. Philippe Herreweghe's recording for Archiv Produktion was made in January 1981 at the Church of the Carmelites in Ghent and was the first to reflect historical practice , in the musical text itself as well in the performance. Herreweghe used for the recording an older, handwritten copy of the score in the Bibliothèque National de Paris, which presumably represents Gilles' original. Thus the work, previously known only in Corrette's extravagant orchestration, with the addition of oboes, horns, trumpets, timpani and drum, and the thick, saturated sound of modern instruments, suddenly appeared in an entirely new sonoric garb - lean and taut, sharply accented, transparent and with intensely brilliant colours. The CD was released by Archiv Produktion, 1981, (ADD). 471722-2 ABL. Collegium Vocale Gent, Musica Antiqua Köln, conductor: Phillipe Herreweghe, played on period instruments. "Herreweghe has accomplished a profoundly moving performance"